Self-Watering Patio Planter, $40. This is the size of a large storage bin, less deep than the big planter above. They even have a special Tomato Success Kit, by Gardener's Supply for $65. The containers above are expensive. 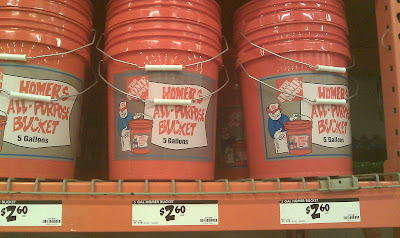 You can make your own with 5-gallon buckets. They are available at Walmart, Home Depot and Lowe's ($2.67 to $3.60). Walmart has white, no label containers which should work best from an aesthetic vs. the bright orange or grey containers with the logos of the home improvement stores.